The Page of Pentacles tarot card represents a quest for knowledge and wisdom. The image of the young man in the Page of Pentacles card symbolizes an inquisitive and open mind, rather than actual age and gender. In fact, in many tarot decks the pages are even called princesses. In the Ten of Pentacles, wisdom was gained from observing known moral and natural laws and reflecting on a lifetime of experience. But the young man in the Page of Pentacles card is literally a blank slate. His mind is like the freshly plowed field in the background. In the pursuit of higher knowledge, symbolized by the tall blue mountain in the Page of Pentacles card, he has literally plowed under outdated ideas and beliefs. Like the field, his mind is ready to be seeded with new knowledge and experiences. There is so much information to absorb. 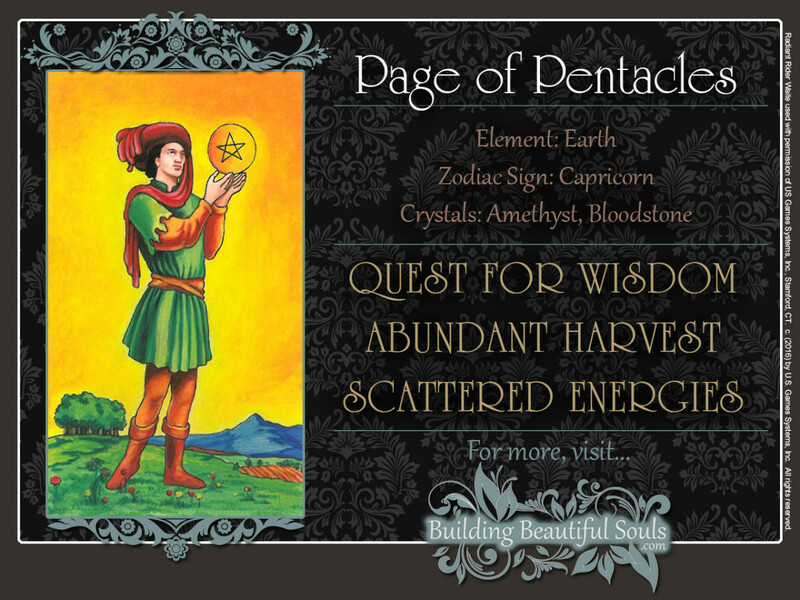 The Page of Pentacles tarot card has a double aspect of Earth, shown by his brown and olive clothes, so his movements are slow and deliberate. The yellow sky shows that the activity in the Page of Pentacles card is intellectual, rather than physical. In this respect, the Page is a lot like a toddler staring into space. Nothing much seems to be happening on the surface but deep inside, the child’s mind is actually very busy processing information. The “toddler stare,” by the way, is perfectly normal. Like Charles Darwin (1809-1882) traveling the world on the HMS Beagle, he observes, taking a few specimens here and there, but interfering as little as possible. His philosophy is to tread lightly. The Page of Pentacles’s understanding of the world is gradually coming together. Just like the pentacle hovering above his hands, it is almost in his grasp. He is filled with a passion for learning, as shown by the red cap and scarf. His joy is also reflected by the flowers at his feet in the Page of Pentacles card. As we can see from his intent gaze, learning is all he seems to be interested in for now. ***Note*** – The Page is not always a male. There are tarot decks which depict them as “princesses” or female. In a reading it will be up to the reader to determine what gender The Page represents. You are putting the pieces of the puzzle together. If the Page of Pentacles card is upright in your tarot reading, the time is coming to figure out what it all means. The universe is sending you back to school. New information is challenging you to rethink everything you know about a person or situation – perhaps even your place in the world. This doesn’t bother you in the least. In fact, you’re very excited about it. You are filled with a clarity of mind and intuitive focus that is making you receptive to new ideas and inspirations. You know that it will take time to understand the full scope of your new discovery. But you don’t mind, because every new piece of information is helping you understand the big picture one piece at a time. As things gradually take shape, you fully immerse yourself in your journey of discovery. On this journey, you may learn new things about yourself. You may even discover hidden talents you didn’t know you had. What about those doodles you’ve been drawing while on the phone – or in class? Are they revealing an artistic talent that could develop into something pretty impressive with a little nurturing? A friend or loved one may reveal a side of his or her personality you never suspected, and you feel like you are getting to know that person all over again. A recent experience may open you up to a new field of interest. For example, a song you have heard on the radio is inspiring you to read the book it is based on. Or reading Henry David Thoreau’s Walden, you are now exploring ways in which you can lead a life that’s more in tune with nature. Exploring a different part of the town or a leisurely stroll may lead to interesting discoveries. Perhaps, you’ll even make a valuable find at your local thrift store or neighborhood yard sale. The Page of Pentacles tarot card also suggests that important messages are on the way. Your mind and energies are scattered now. You feel like you’re not applying them efficiently and that you are wasting too much time. That’s probably right, but it’s not the whole story. When reversed, the Page of Pentacles suggests that you need to treat yourself with kindness and patience. After all, there’s a lot of information to process and much to do. You don’t even know where to begin. Spinning your wheels will only confuse you further and wear you out. Instead of focusing on everything that still needs to get done, take a quick breather to reflect on what you have already accomplished. Then make a plan to reach your goal and be methodical about getting there. This will put things back into perspective. However, getting angry and frustrated – especially with yourself – is the least productive way of handling the situation. That will only make things worse. Instead, try to discover what exactly is blocking or dissipating your energies. Since we are dealing with the Page of Pentacles, the most likely cause is that recent incoming information is slowing down your usual progress. For example, when you are installing a new operating system on your computer, the new version may have a very different look and feel from the one you’ve been using for years. There’s a learning curve, and finding your old files can be quite the (mis)adventure. Screaming at the tech from customer support won’t help, no matter how frustrated you may be. Be patient as she walks you through the new process of finding your documents. If the same way of doing things isn’t moving you forward, try a slightly different approach. Take mini breaks to recharge your mental batteries, but avoid wasting time on your favorite social network. A brisk walk around the block can do wonders to clear your head, as long as you don’t stop for a drink at the neighborhood bar. In the tarot, the pages are associated with the number 10. That’s because they represent the Earth aspect of each suit. In a sense, they further expand on the meaning of the tens, showing that the completion of one cycle is also the beginning of the next. Your view of the universe is complete. Now it is time to make sense of it.